Though diners’ appetites for coffee are seemingly bottomless, adding a full-service coffee shop to every corner of a facility probably isn’t in the playbook. Here’s a look at how two operators added coffee service with relatively small footprints—with one decidedly futuristic (robot barista, anyone? ), and the other low-tech but nimble. Dell has a full-service Starbucks on its Red Rock, Texas, campus, but the location isn’t always convenient for a quick coffee pickup. “Certain times, you go into the bistro, like 7 a.m. to 9 a.m., there’s quite a long line,” says Judy Stone, manager of dining and foodservice. To meet the demand for more coffee around the clock, Stone worked with Dell’s foodservice provider in 2015 to bring in an automated coffee kiosk to provide 24/7 coffee service in a different part of the same building. 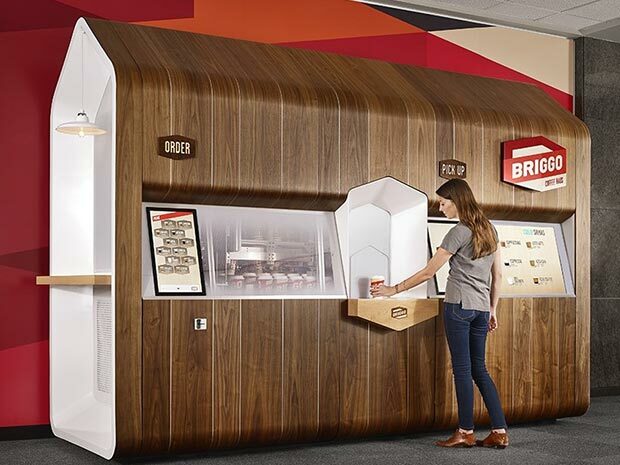 The kiosk, from an Austin-based company, uses robotics to make custom coffee drinks to order. A window on the front shows the robot barista in action, while a screen displays details such as order status. Customers can choose the temperature, brew strength, milk, sweetener and flavoring. Once customers get the combination they want, they can save their order so it’s identical every time. Dell employees can order their coffee at the kiosk or via a mobile app. For example, Stone saved her go-to drink, a skinny vanilla latte, as a favorite on her app, so she can order ahead on her commute. She receives a text when it’s ready, and the unit keeps her latte warm until she enters a three-digit code and retrieves her cup. When Mandarin High School in Jacksonville, Fla., added a permanent coffee shop with flavored coffees and charging stations, the reaction was overwhelmingly positive. Without the resources to duplicate the cafe in every high school in the district, Jane Zentko, contract compliance director for foodservice at Duval County Public Schools, and her team put together a pop-up coffee station, Hometown Bean & Co., in May 2016 that hops from school to school each week. “Our pop-up coffee station is set up using folding tables, so it’s an easy setup and tear down,” says Zentko. Duval’s foodservice team dresses the station up with black tablecloths, bamboo tiered shelves and custom marketing materials to make it look like a true coffee shop. The station is designed to be a quick stop for students before their next class. “Students place their order by selecting the hot beverage of their choice, selecting what flavor [syrup] they would like to add, and the staff makes the drink on the spot using prebrewed beverages,” Zentko says. “Since the station is only in a school one week at a time, it has created a sense of excitement and urgency for students and staff to take advantage of the program while they can,” Zentko says.